"Onua said nothing. Of all the Toa, he was the best at not speaking unless he had something worthwhile to say. Only Kopaka lived in greater silence, by choice." Onua was the reserved and reflective Toa Mata of Earth and part of the team tasked with awakening the Great Spirit Mata Nui. After being exposed to Energized Protodermis, he was transformed into the Toa Nuva of Earth. Onua and the rest of his team were created on Artakha. When they were sent to Daxia, they were awakened by Helryx, then introduced to each other and told of their destiny: to be the guardians of the Great Spirit Mata Nui. Afterwards, Hydraxon trained them in combat, and other situations that they might encounter. On one of these exercises, Hydraxon took their Kanohi and hid them across the island, to train them for a situation when Kanohi would not be available easily. The Toa spent most of the day trying to figure out how to get their Kanohi back, until Lewa realized that Hydraxon wanted them to work together and they managed to retrieve them. Shortly afterwards, Hydraxon gave each of the Toa Mata the task of trying to escape Spinax, Hydraxon's Energy Hound. After they finished their training, the Toa Mata were then sent to Karda Nui to protect the Av-Matoran who were working there. The six Toa fought against many Rahi, which were being affected by strange energy spikes. After they defeated the Rahi, sentient lightning bolts called Avohkah began to attack the Matoran. After several weeks of fighting the Avohkah, the Rahi were finally defeated and the Av-Matoran finished their work. Tahu and Kopaka then led the others to the Codrex, the strange, spherical building embedded in one of the stalactites. The hatch sealed them in after they entered, and the two Toa were forced to tell the others about their talk with Toa Helryx, and how they needed to enter the Toa Canisters within the Codrex. They could not leave, because the energy storm that now filled Karda Nui would turn them to ash. They then entered their separate Toa Canisters, where they remained for thousands of years. The team's canisters were supposed to be activated following the Great Cataclysm and land on the island of Mata Nui. When they arrived, they were supposed to go to Kini-Nui, use the secret tunnel system to head into Metru Nui, and awaken the Great Spirit. However, a mysterious malfunction caused the canisters to instead land in the sea around the island. The canisters floated in the ocean for a thousand years, until the Av-Matoran Takua collected the Toa Stones of Mata Nui and inadvertently summoned the Toa. The canisters then activated, and set a course for Mata Nui. When Onua awoke he was in pieces and did not remember anything of his past. After reassembling himself, he made his way to Onu-Wahi and encountered an Onu-Matoran named Onepu. Onepu brought him to Turaga Whenua, who told the Toa of Earth all about Teridax and the Kanohi masks of power hidden around the island. He explored and encountered three other Toa Mata: Tahu, Gali, and Lewa. The four later encountered Kopaka and Pohatu, and the two Toa joined them. After proper introductions, they were exposed to a violent storm, which they later concluded was the work of the Makuta. They each went their separate ways, to the chagrin of Tahu, to search for their masks. Though each Toa had minor success, it was clear to Onua that it would be foolish to go alone, and he called a meeting to gather the Toa together so they could continue forth as a team. Before they set off, Teridax triggered the volcano, and unleashed several Rahi on them. Onua and Lewa used their powers to halt the lava flow, and the other Toa dispatched the Rahi, though not before Onua caught a falling Tahu, and used his strength to take out several Nui Rama. Onua later saved a dozen Matoran by using his tunneling skills to create an escape for them, encountering and defeating a Doom Viper along the way. Onua tunneled into the Nui-Rama Hive during the Battle of Le-Wahi in search of a missing Lewa. Toa Lewa, who had become infected and controlled by Teridax, fought against the Toa of Earth. The two clashed until Onua, with some quick advice from Matau, was able to gain the upper hand and knock the tainted mask off his friend. The two then rescued the population of Le-Koro who had been captured at the time. As Onua, Kopaka and Gali already had acquired a Kanohi Kaukau, they sojourned underwater to retrieve Tahu's. Encountering and defeating a Tarakava, Onua proved that by removing their infected Kanohi, they could remove Teridax's dark hold over the Rahi. Having successfully collected all of their Kanohi, the Toa traveled to Kini-Nui, on the advice of Kopaka, to find their Golden Kanohi. Placing all of their Kanohi on the statues at Kini-Nui, Golden Kanohi came in exchange, completing the Toa's quest for the masks. They bidded the Chronicler's Company and thanked them for accepting their mission of guarding Kini-Nui until the Toa return. Afterward they combined the Makoki Stone and used them as a key with which to enter Mangaia. In the tunnels leading to it, Onua combined with Pohatu and Tahu to form Toa Kaita Akamai. Along with Wairuha, he battled the Manas and defeated them by crushing towers that provided heat for them. As they entered Teridax's inner realm, the Toa Kaita were torn apart into the Toa Mata once again and they fought the Shadow Toa. Upon realizing that everyone had a shadow in them they reabsorbed the Shadow Toa into themselves. They soon encountered Teridax himself and battled him. Using their Golden Kanohi, Elemental Powers, and their unity, they succeeded in defeating him for some time. Shortly after leaving the Kini-Nui, the Toa felt a strange shaking throughout the island. A Ta-Matoran arrived, muttering one word over and over: Bohrok. The Toa headed for Ta-Koro, and found the Pahrak and Kohrak attacking the village. The battle soon ended when Lewa and Gali combined their powers to create a thunderstorm that drove the Bohrok off. Vakama explained to them what Bohrok were, and that they needed to collect the eight breeds of Krana. Onua went to Onu-Wahi and heard some Nuhvok on its way. He hurried to the location of the chaos, and realized that the Bohrok were trying to bring down a cave by destroying its support pillars. Onua tried to stop them, but was attacked every time he got in their way. The Toa of Earth came up with a plan; he dug a deep trench around the last standing pillar, and waited until the Nuhvok turned their attention to it. The Nuhvok, being not very bright, fell into the trench and became wedged in between the walls of the hole. He and the Onu-Koro population were eventually swept away by a Gahlok flood. He then went searching for Lewa after recovering his Miru from a group of Lehvak Va. The Krana-controlled Lewa attacked Onua, and nearly defeated him. Onua, however, knew that the Krana was not in control of Lewa's will, and convinced him to remove the Krana. After collecting all the Krana, the Toa descended into one of the Bohrok Nests found by Kopaka. They became separated from Tahu when a wall moved in front of them. They soon found themselves trapped in the tunnel and a barrage of molten lava came rushing towards them from above. As Kopaka held off the lava with ice, Onua and Pohatu tried to break through the wall but found it impossible. Lewa, still partially under the Krana's influence, realized that the wall was nothing more then an illusion and they were able to escape. After meeting up with Tahu, they found six Exo-Toa, and used them to fight the Bahrag using their Electro-Rockets, the queens of the swarms. Onua and Pohatu both fell victim to Cahdok's illusions and could not tell that they were merely fighting empty air. Tahu realized the Exo-Toa hindered their Elemental Abilities, and they shed the suits of armor. The Toa combined their elemental powers, trapping the Bahrag in Protodermis. The ground opened up and the Toa fell through, only to be immersed in Energized Protodermis, transforming them into the Toa Nuva. Discovering that their new masks allowed them to share powers, Tahu saved the Toa from falling boulders. The powers of Pohatu and Lewa let them fly to a cavern closer to the surface. Onua, Tahu, and Lewa used the Pakari Nuva to delay a rampaging swarm of Tahnok. Kopaka aided the efforts, but the Pakari Nuva's usage weakened the cavern. Utilizing their Kanohi Nuva, they managed to fly from the cavern and reach the surface. After returning to the surface, the newly christened Toa Nuva faced each other in a mock battle to display how much more prowess and power they had. With their newfound powers, the Toa Nuva decided they were now strong enough to face any threat alone, although Gali strongly disagreed. With their unity shattered, the attack of the Bohrok-Kal began. The Kal proceeded to steal the Nuva Symbols that contained the Elemental energies of the Nuva. Now with their Elemental Powers gone, the Toa had to re-find their unity to defeat those monsters. They now had to search for the Kanohi Nuva, hoping they would give them more of an edge against the Kal. Onua traveled with Whenua in the caves of Onu-Wahi, looking for a Kaukau Nuva. They found a giant tentacled worm along the way. Onua drove it back by slamming two boulders together, creating a loud noise. They also encountered a large amount of Kofo-Jaga as they went deeper. Later they encountered two Manas, guarding the Mask they had been searching for. Onua had a stroke of brilliance, and drilled through the walls, releasing a small lava flow into the cave, luring the Kofo-Jaga they had seen earlier. The rahi rushed in, attacking the Manas. With the giant crabs distracted, Onua jumped over them and quickly grabbed the mask. When all the masks were found, the six Toa Nuva were united once more, in a cavern deep under the island. They encountered the enormous Rahi Nui, which they defeated, and returned, all of them alive and well. The Toa began their search for the Kal by returning to the Bahrag in the nest. When they arrived, they found the Bohrok-Kal were already there. Then, using the Kanohi Vahi that Vakama had given him, Tahu managed to hold off the Bohrok-Kal for a brief moment. Because the energy needed to use this mask was so enormous, Tahu nearly fainted and died from its use. Finally, Gali came up with a plan to focus their minds on the Toa Symbols, channeling the powers of the symbols into the Kal, overwhelming them with power. The Toa Nuva regained their Elemental Powers and returned triumphantly to the surface. During the search for the Seventh Toa, Pohatu and Onua were taken by Whenua to the outskirts of Po-Wahi and shown the Turaga's collection of Kraata in stasis. A Guurahk and Panrahk then attacked, generating a shockwave that shattered the tubes and sealed them inside. They managed to blast their way out, however, and discovered that the other Toa Nuva had followed the Rahkshi to that area. Tahu and Kopaka sealed the cave behind them with only one Kraata getting through: A Shadow Kraata. After separating from Jaller, Takua and Pewku made their way to the village of Onu-Koro, where Pohatu and Onua were announcing the discovery of the Mask of Light. As they inquired where Jaller had gone, a group of Rahkshi including a Vorahk, Kurahk, and Turahk burst into the cavern and began attacking the village. A tremendous battle ensued as the rest of the Toa Nuva arrived to battle the Rahkshi. Onua attempted to fight the Vorahk but was temporarily defeated when he used his Staff of Hunger to steal the Toa's power. After he awoke, he continued the battle and destroyed a good portion of the cave-ceiling, bringing it down on his assailants. It damaged too much of the area, however, and buried both Pohatu and himself in the rubble. Later, Kopaka managed to rescue them. Many more struggles took place all over the island, but the greatest took place at Kini-Nui. All six Toa had assembled to defend Takua and Jaller from the six Rahkshi and they united their powers against them. They protected them just long enough for the transformation of Takua into Takanuva to take place, which allowed for all the Rahkshi to be defeated. Onua assisted the rest of the Toa in constructing the Ussanui out of the Rahkshi's armor and he and Pohatu contributed the Shadow Kraata they had found so that the Ussanui could be powered towards the lair of the Makuta. Upon arriving back on Metru Nui along with the others, the Toa Nuva and the Turaga were immediately invited to a secret meeting of Dume's. There, Dume revealed that Mata Nui was dying, and his only hope was the Mask of Life located on the island of Voya Nui. Onua eventually traveled to Voya Nui using a Toa Canister similar to the one he had used to arrive on Mata Nui. Upon arrival, Tahu insisted that they begin searching for the Mask of Life near Mount Valmai. While journeying there, the Toa encountered the Piraka and a great battle began. Onua stayed in the battle the longest but eventually fell at the hands of Vezok. Zaktan, the leader of the Piraka, ordered the others to throw him and the rest of the Toa Nuva into Mount Valmai and get rid of any threat they might pose to him. When the Piraka were just about to throw the Toa in the crater to their doom, an eruption occurred and they fled the area. The Nuva, having had their Kanohi and weapons removed, defended themselves from the eruption as best they could. When they finally managed to escape, they encountered the Voya Nui Resistance Team. Thinking that the Nuva were just more Piraka calling themselves Toa, they attacked the vulnerable team. In the nick of time, however, Balta told the others that they were indeed real Toa. In the end, the Matoran and the Nuva allied themselves together and tried to raid the Piraka's base. Brutaka then arrived, and defeated the Nuva and the Matoran with a single blow. Onua was placed in the Piraka's custody with the others, and ordered to pour his elemental energies into a pit to weaken him. Onua, along with the other Toa Nuva, was later rescued by the Voya Nui Resistance Team, who snuck into the Piraka's fortress while the Toa Inika battled the Piraka. The Matoran discovered the Kanohi Nuva, and despite fearing the death of the Toa Nuva, continued to search, eventually discovering them captive. The Matoran freed the Toa, giving them back their masks and weapons. The twelve then met up with Axonn and Botar, who was carrying Brutaka, newly defeated by Axonn. The Toa spoke with Axonn, who revealed that the Toa Nuva must find the Scroll of Preparations. The Toa Nuva were sent by Axonn to Metru Nui's Great Temple to retrieve a scroll on which was written several steps necessary to awaken Mata Nui. Onua traveled with the other Toa Nuva to the island of Mata Nui, where they began the first phrase of their mission: awakening the Bohrok. The Toa were very hesitant to do this, however, and Onua had to step forward and unleash them by himself, for he knew that it was necessary. Afterwards, they proceeded to Odina, where they sought out the Staff of Artakha. After a short discussion with the Shadowed One, they gained information on the staff and proceeded to Xia, where the Tahtorak and Kanohi Dragon were battling fiercely. While the others tried to rescue the natives from the chaos, Onua burrowed underground to the place where the staff was held. There, he was defeated by Icarax, who took the staff from him. He rejoined the Toa Nuva and informed them of this, going with them on their trip to Karzahni. There they were ambushed by Icarax and Onua was knocked unconscious. He was later revived after Gali destroyed the realm using a Nova Blast. He was soon after sent journeying with Pohatu to find an artifact called the Heart of the Visorak. The two were found by Botar and teleported by him to Daxia where they witnessed the Staff of Artakha being used to restore the Universe to its condition before the Great Cataclysm. Onua and the other Toa Nuva departed to the land of Artakha, where they were given Adaptive Armor. They were then teleported to Karda Nui by the realm's leader. Upon arriving in Karda Nui, the Toa Nuva split into two teams: Lewa, Pohatu and Kopaka as the Phantoka; and Gali, Onua and Tahu as the Mistika. When the Toa Nuva Mistika arrived at the Swamp of Secrets, they split into different directions. Onua saw a Nui-Kopen flying towards him, so he swatted away the creature. The Nui-Kopen fell into the swamp and began to mutate. Onua realized there was something in the swamp the others had to be warned about, but as the Rahi charged at him again, something struck him before he could defend himself. Makuta Bitil appeared, now with Onua under his control through his Nynrah Ghost Blaster. The Makuta then took him to Krika's camp, which served as the headquarters for the Makuta Mistika. Bitil triggered his Mohtrek to summon copies of himself to keep Onua from escaping. When the Ghost Blaster's effects wore off, however, Onua knocked the Makuta out of the way. Bitil immediately summoned more of his copies and the Toa of Earth was surrounded by about fifty of them. Onua created an explosion of mud and fled into the air, followed by Bitil, who had deactivated his mask. Onua then took out his weapon, fired it and knocked his foe out of the sky. Onua escaped to find Gali, who was close to defeat at the hands of Gorast. Angered, he grabbed Gorast from Gali and smashed Gorast into the ground. While Gorast lay dazed, Onua checked on the Toa of Water. Gorast attempted to turn Onua to their side, telling him that he could have all of Metru Nui and be a king to the Brotherhood of Makuta, Onua refused and used his powers again to create an explosion of mud directed at Gorast. He then took Gali and both flew to find Tahu. Onua and Gali found Tahu weakened but still alive from his brief encounter with Krika. Then the Toa and Makuta saw one of the other Makuta falling from the sky; Chirox. As the Makuta rescued their brother, the Toa left with an Av-Matoran who brought them to safety. Onua and the others arrived, seeing the Matoran going through a transformation. What shocked them was seeing the result of the transformation; Bohrok. Onua recalled that he heard a theory by Mavrah about how Bohrok were once bio-mechanical life and were later evolved into mechanical, artificial forms. The Matoran who brought the Toa to safety presented a Keystone and transformed into a Bohrok and teleported to the island of Mata Nui. The team later spied on the Makuta as they hid another Keystone. Tahu devised a plan, and the Toa used their elemental blasts at a delayed time to distract the Makuta. As they retrieved it, the Makuta returned and tried to stop the Toa Nuva. Krika said that his team was searching for the Kanohi Ignika, but Tahu tried to pretend that it was with Pohatu and the others up above (not knowing it was in fact with them). Bitil thought it was a trick and send a telepathic message to one of the Phantoka Makuta. When the message returned, both sides were shocked that the Mask of Life became a Toa and Icarax had already fallen before its power. Tahu then threw up a shield, Gali created a mist veil, and Onua dug tunnels to escape. The Makuta raced to the Codrex, believing that the Toa would head there. Tahu decided that the team should fly over the Codrex, thinking that the Makuta might have reached the Codrex before his team could make it. He was right, as they saw the Makuta guarding it as Onua and the others were in the sky, high enough to stay hidden in the mists. Then they flew down at a rapid pace, charging at the Makuta for a battle between them. But later, the Makuta Phantoka arrived, leaving the Toa surrounded by the six Makuta. They pinned the Toa to the Codrex's energy field and Antroz started to create a shadow blast. As the blast began to leave his hand, Kopaka froze it, as he, Lewa, Pohatu, Tanma, Solek, and Photok arrived. The Mistika Toa Nuva then joined the other half of their team to begin a final battle against the Makuta. The two sides clashed, neither side gaining an advantage. Onua suspected that the Makuta were only attempting to delay them, knowing that their power outmatched the Nuva's. Takanuva arrived and helped temporarily drive the Makuta back, giving the Toa time to regroup. After being informed of the Energy Storms, and the Ignika's countdown to the impending doom of the universe, the Toa flew towards the Codrex, combatting with the Makuta along the way. Onua was hit by a power scream and knocked out of the air, but saved by Gali. The Toa succeeding in fending off the Makuta, and entered the Codrex safely. Onua realized that they had been in the Codrex before, and while exploring, accidentally triggered three vehicles to be released; the Axalara T9, the Rockoh T3, and the Jetrax T6. While the Toa admired the vehicles, Antroz, who had followed them discreetly, stole the Jetrax T6 and escaped the Codrex, chased by Lewa, Pohatu, and Kopaka. Onua, Gali, Tahu, and the Toa Ignika remained in the Codrex, beginning the process to awaken Mata Nui. Though the process was too slow, the Nuva managed to convince the Ignika to provide the jolt of energy needed to perform the process properly, though not before the Ignika tried to kill Tahu at the idea. The Ignika sacrificed his newfound life, and unleashed his power. The Energy Storms began, and the Toa Nuva managed to escape Karda Nui with the assistance of the vehicles, leaving the Makuta to perish. The Toa returned to Metru Nui and celebrated the awakening of Mata Nui. Their victory was interrupted by their confrontation with Teridax, and his revelation of his dominance of the universe. Soon afterwards, Teridax sent Rahkshi into Metru Nui to terrorize the Matoran. Onua, the other Toa Nuva, the Matoran, and the Turaga hid in the Archives to avoid them. The Turaga later met up with Krahka, who told them of a long-unused tunnel leading to the shoreline. There, they stole a boat, hoping to meet with Toa in other lands and start a rebellion. On Stelt, they met up with the Order of Mata Nui agent Trinuma, who told them of Daxia's destruction. Onua later returned to Metru Nui, and began fortifying the Archives to make it harder to breach. Onua eventually learned of several Order of Mata Nui agents that were searching for a hidden cache of weapons and informed Tahu of this. However, Rahkshi attacked the agents and took the supplies, and Onua went to find Tahu, arriving in Karzahni just in time to rescue the Toa of Fire's band of rebels from Exo-Toa by opening a chasm beneath the machines. He suggested to Tahu that they travel to the ruins of Daxia to eliminate the pool of Energized Protodermis where he suspected Teridax was forming Rahkshi. The group reached Daxia and successfully destroyed the pool. Tahu and Onua prepared an ambush for some Rahkshi, but they turned away moments before the trap could take effect. A winged Order of Mata Nui member arrived and informed them that legions of Rahkshi were moving toward the Southern Islands. Tahu then commanded her to gather as many Toa as she could find and venture south. Onua later answered Tahu's call to arms, and helped fight in the Battle of Bara Magna, which eventually ended in Teridax's death and defeat. On instructions from Tahu, Onua gathered three Toa, Orde, Chiara, and Zaria, and assigned them the mission of finding the Great Beings, something Mata Nui had asked them to do. He also introduced them to the Glatorian Gelu, who would guide them. In an alternate reality, Onua, along with all the other Toa Mata, were placed into Toa Canisters to prepare for the day when they would be called upon in and act as the failsafe for the Great Spirit, like they were in the main universe. However, since the Great Spirit Mata Nui never fell asleep in the alternate universe, no signal was sent which called for the Toa to depart to Metru Nui. Toa Tuyet, however, discovered a spot in the Coliseum which nobody knew about, and was able to fake a signal which summoned the Toa to Metru Nui. There, the Tuyet told the Toa Mata about how the Brotherhood of Makuta and the Dark Hunters were taking over, and that they needed to be stopped by the Toa Empire. Onua and the Toa Mata decided to follow her rule. Onua took part in a battle between the empire and a resistance group led by Pohatu at the Coliseum, and during it smashed the Po-Matoran Ahkmou after Kopaka froze him. He then fought Pohatu, but they were too evenly matched. As one of the Toa who survived the collapse of the Matoran Universe in this alternate universe, Onua warded the ground separating the planet surface from the black void that universe had become to insure that no Rahkshi could penetrate it after Toa Takanuva sealed off the tunnels with light barriers. Onua is a wise Toa, one of the wisest of his team, and is never impulsive or reckless. He does not speak without good reason, choosing only to speak when he sees worth in it, and is often silent as a result. His silence has puzzled others in the past, but he is known to be intelligent, and a problem solver. He is also very patient, understanding the value of waiting. He is reliable and steadfast, and was always able to be counted on. Although he knows when his teammates are making mistakes, Onua is willing to let them do so, believing in the value of knowledge gained from it. Onua controls the element of Earth. With it, he can make earth pillars, create an earthen fist, ride on a moving chunk of earth, make the ground explode, and other similar feats. He is also an expert at digging and can sense even the tiniest vibrations through his sensitive fingers. Like all Onu-Matoran and Earth Toa, he has above-average night vision but poorer vision in average daylight. Upon being exposed to Energized Protodermis, he was transformed into a Toa Nuva, which increased his elemental powers, allowing him to be able to set timed earth attacks. As a Toa Mata, Onua had Claws. [BEU, p. 108] He wore the Kanohi Pakari, the Great Mask of Strength, which allowed him to enhance his strength massively, even beyond that of Pohatu. In preparation for his battle with Teridax in the Mangaia he traded this in with five other masks at the Kini-Nui to obtain a Golden Kanohi with the powers of all six. When Onua was transformed into a Toa Nuva, his claws were replaced with twin Quake Breakers which could be attached to his feet as high-speed tracks. 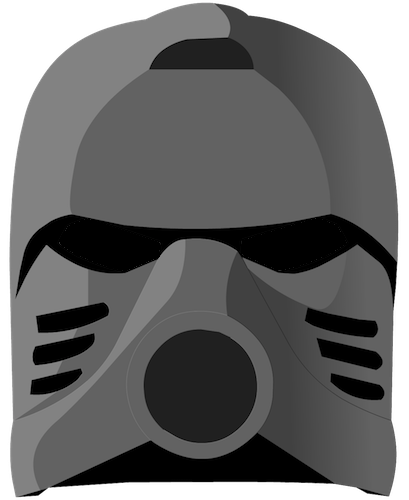 His mask became the Pakari Nuva, the Kanohi Nuva of Strength, which let him share his increased strength with others. He lost the powers of his five secondary Kanohi, however, and had to collect the five corresponding Kanohi Nuva and place them on his Suva to regain these powers for himself. After receiving his Adaptive Armor, Onua carries a Multi-Resistant Shield and an adaptive weapon, which became a Nynrah Ghost Blaster for combat with the Brotherhood of Makuta. In Karda Nui his armor was equipped with a rocket on each leg. However, he did not have access to his five secondary Kanohi Nuva from inside the dome of Karda Nui. 8532 Onua was released in summer 2001 as a thirty-piece canister set. By moving a gear on his back one could make the model swing both its claw-wielding arms in opposite directions. This model's parts and instructions, with parts and instructions from the Tahu and Pohatu sets of the same year, went towards building the Toa Kaita Akamai. Parts from Onua and Pohatu could be combined to form a black Fikou spider. 8566 Onua Nuva was released in summer 2002 with forty-one pieces. His gear function, the same as before, could also be modified by replacing the gear and axle of the left shoulder with an included pin. By moving the gear and axle to the model's back one could spin the operation gear to swing the model's right arm by itself or pull what was previously a shoulder gear into a position further from the set, locking the right arm in one pose via the operation gear. An axle and bushing on each foot allowed one to fasten his Quake Breakers to his feet to act as high-speed treads. The parts and instructions of Onua Nuva could be combined with those of Tahu Nuva and Pohatu Nuva to build the Akamai Nuva set. As a promotion for the film, BIONICLE: Mask of Light, Onua appeared as one of a set of UK Burger King toys in 2003. This toy depicted Onua Nuva as he appeared in the movie and is not compatible with Lego parts. 8690 Toa Onua was released in the summer of 2008 in a new Mistika form of the Adaptive Armor. Onua consists of sixty-two pieces. This form features an attachment point on the back for a small 2008 Matoran set. Although no small Matoran set was designed to ride Onua either in set or story, the Av-Matoran Photok demonstrates this feature in promotional material. Onua Nuva Mistika wields a Nynrah Ghost Blaster with a laser sight, and wears a Multi-Resistant Shield on his left arm. Onua can be combined with Tahu and Gali to create the Order of Mata Nui member, Trinuma. Onua in his Mistika form was also part of McDonald's BIONICLE "Happy Meal" promotion in late 2008. This was a small action figure and was also not compatible with Lego parts. A large model of Onua in his Toa Mata form was constructed entirely out of LEGO System Bricks, and made available for promotional use. It was housed in a transparent canister resembling the one the set was packaged in. "You are a Toa -- Prove yourself worthy of the name!" "You did not defeat the Toa Nuva -- We simply found your company so boring, we chose to take a nap." "I believe I've done what I had to do. I've taken the first step toward the future. No one ever said the trip would be an easy one." "Nothing like controlling earth when you are in a world of mud -- I feel like Kopaka in a blizzard!" "My armor's black. That doesn't mean my heart is as well." "Well, we all need to do better... Someday, it won't be the trainer we'll be up against, but the real thing." Scott McNeil voiced Onua in Mask of Light. A running storyline joke regarding Onua is his tendency to save others at the last moment. Examples include removing an infected Kanohi and Krana from Lewa, among others. During the prototype stages of BIONICLE, Onua was named Claw.